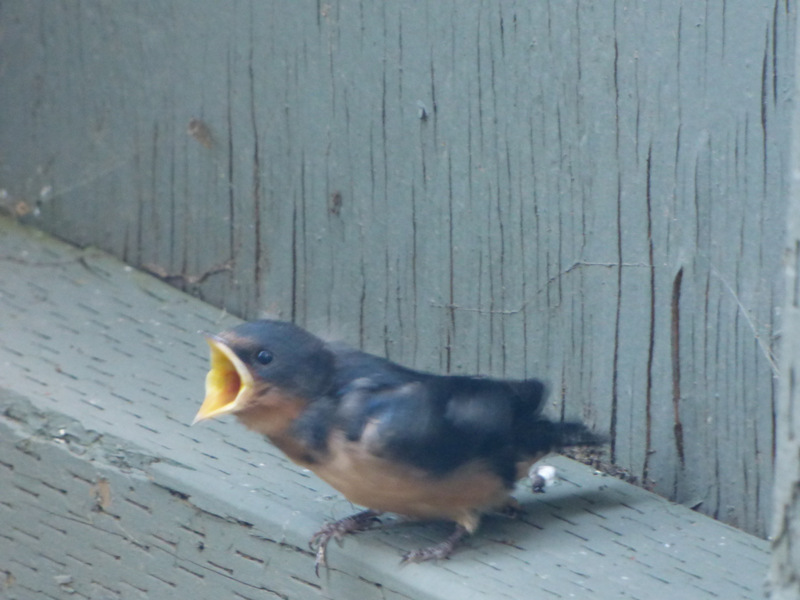 I’ve written a couple of posts about the barn swallows who’ve nested in the eaves of my patio, most recently back in April, but they’ve been providing so much entertainment recently that i need to add an update. 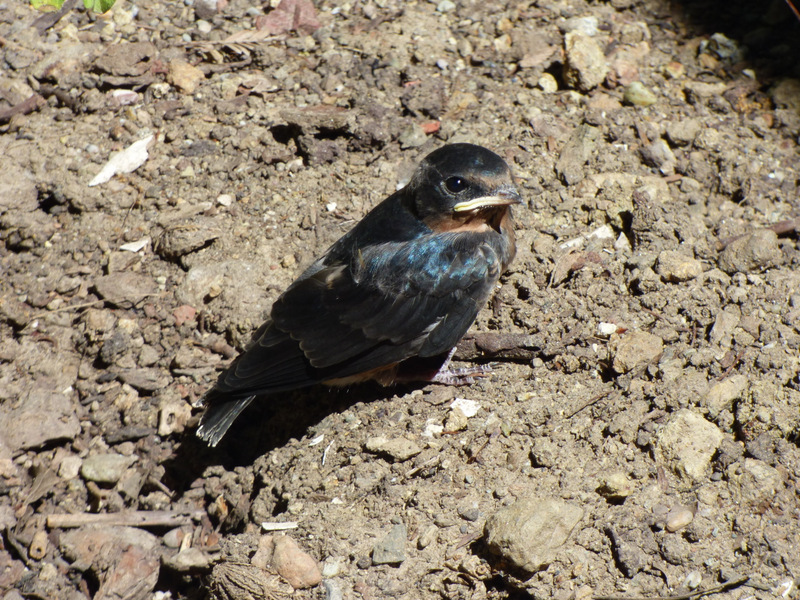 The drama began a few days ago when i went out onto my patio and nearly stepped on a young barn swallow huddled on my doormat barely moving. Tried to scoop him up without getting my hands on him and get him back into the nest, but don’t have a ladder and can’t climb up there. Watched him for a while, and the parents, who are totally tame around me and will let me get within reach of them without flying, are refusing to take care of their fallen kid. So i leapt into the breach. Gently picked him up, which he hardly resisted at all. Decided what he needed most was water, so i put some into a little bowl and repeatedly dipped his beak into it. After several tries, he started slightly opening and closing his beak, enough so that i figured some water was getting in. An hour of so later i went out and he seemed much stronger, sitting up better and looking more alert. So i did the water torture again while the damn parents remained utterly indifferent to him and kept feeding the two remaining in the nest. Kept going out there to check, and he seemed even more alert and chirped back at me when i gave him my little warble. Tried sticking a tiny sliver of ham on a toothpick, but he wouldn’t open his mouth. Tried that again later, to no avail. Then tried again, and he finally caught on, opened his mouth, and engulfed the toothpick with ham bit. Did it again later with a little sliver of roast pork. And a couple of times later with some comté cheese. Then dipped my finger in water and let a drop or two fall onto the beak, but he didn’t seem at all eager to take fluids. Since it was going to get down to 47 at night, at dark i put him into a cardboard box and brought him inside for the night since he wouldn’t have the others to snuggle up to to keep warm. Realizing that a diet of ham and cheese sandwiches is probably not good for him, i thought tomorrow i’d dig in my flowerbed for a worm to section up for him. Took him outside in the morning, but he wouldn’t eat and was dead by noon. I was heartbroken and trying to decide whether i’d poisoned him by feeding him ham and cheese or whether i’d starved him by not feeding him enough. Then i looked up at the nest and noticed that there was only one chick left, so the loving parents had allowed one of his siblings to die also. Which got me off the hook. The good news is that the remaining chick is looking fat and healthy. I interred the one who died on me at the foot of my potato plant, figuring i might as well get some use out of him since i didn’t quite have it in me to eat him. The very next day, the surviving chick jumped out of the nest before he could fly and sat around on the patio all afternoon while the parents buzzed him and performed low level acrobatics as if to demonstrate how easy flying is…but didn’t stuff any food into the wide open, cheeping mouth. I tried a couple of times sticking a morsel of comté on a toothpick and holding it out as i moved closer, but he fluttered/stumbled away. I thought about grabbing him and chunking him out onto the lawn, but he’s probably safer inside my patio. Well, except that he’s gonna starve. The parents are so accustomed to me that they’ll do everything but perch on my outstretched finger, so i took advantage of that and sat down out there and had a dialog with them. I explained slowly and clearly that if they didn’t start feeding their kid, when he got to the point he was so weak that he couldn’t run away, i was gonna grab him, pull his feathers out, skin him, eviscerate him, and eat him. While they watched. Went on to explain that, lest they think this was an idle threat, i just love sushi and carpaccio. Alles klar? Tasty looking little kid you got there. I hope nothing happens to him. That’s all it took, and in just a few minutes one fed him a bite! Whew. And then they were both feeding him, so he’s not going to starve. But he’s not out of the woods. Ummm, maybe i should say he’s not in the woods yet. My fear is that a neighborhood cat, which has spotted him through the mesh at the bottom of the patio fence, will figure out how to get over the fence. I may have dissuaded the cat, though, by chunking at him a clod that hit the mesh and showered him with debris. Haven’t seen him since. The next day, my little surrogate grandchild was hopping around the patio but mainly sitting on my doormat while his parents brought him food. By now he’s so accustomed to me that he doesn’t move when i step over his head onto the concrete, and it has occurred to me that i ought to go to the market and get a bag of Purina Barn Swallow Chow and teach him to take food from my fingers. Naw, he might like that better than bugs, and i’d be stuck feeding him for the rest of our lives. So i left that to his parents, and whaddya know, the next day he started trying to fly, achieving by the end of the day an altitude of one foot, sufficient that he could perch on bottom ledge of the fence, where his parents continued to feed him. And the next day, he was gone, over the fence to freedom. And why do i keep calling him “him”? Easy. It’s a guy thing. No girl chick would be foolhardy enough to jump out of the nest before she could fly.